Leucophyllum candidum - Desert Cenizo, Silver-Leaf Sage - Shrub - Requires extremely well-drained sites and NO supplemental irrigation once established. Leucophyllum zygophyllum - Dwarf Sage - Shrub - Requires extremely well-drained sites and NO supplemental irrigation once established. Leucophyllum zygophyllum 'Cimarron' - 'Cimmaron' Dwarf Sage - Shrub - Requires extremely well-drained sites and NO supplemental irrigation once established. 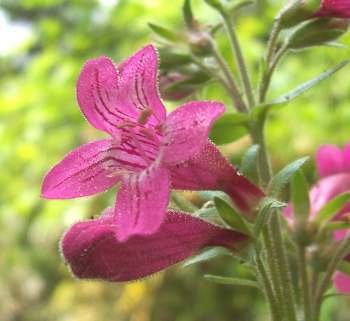 Penstemon triflorus - Hill Country Penstemon - Perennial - The hills are ablaze when this perennial blooms in mid-spring. Give it a perfectly well-drained site in full sun and water only when it barely starts to wilt. This floral jewel is endemic to the Texas Hill Country.That means it grows only in the Edwards Plateau and nowhere else on earth! Its overwintering rosette of somewhat fleshy leaves is evergreen. The multiple flower spikes can reach 24- to 30-inches-high and each will contain several dozen deep purplish-pink blooms.